Andrea Bocelli is the biggest selling living classical music artist. His albums have sold over 80 million copies! Andrea even recently sang for Pope Francis on his trip to the U.S. I'm not sure where I've been, but I have not been listening to any of Andrea Bocelli's music. Until now. Thanks to One2One Network, I have had a chance to listen to his new album Cinema. The album, Bocelli's first new studio recording in two years, will be released on October 23 by Verve Records. It includes a collection of interpretations of songs from classic movies like West Side Story, The Godfather and Gladiator. With the album Cinema, I’m fulfilling a wish that I’ve harboured for decades. I’ve never made a secret of my dream of bringing to life a recording project associated with soundtracks, as I truly believe that it’s an exceptional artistic treasure trove. It’s an area that has always fascinated me: the scores written for films are very free and potentially very creative. A vast grassland where the composer can roam as he pleases, whatever his inspiration, where he can experiment without having to submit to the norms of the classical song (based on the sequence requiring two strophes, one short instrumental passage, one strophe, one short instrumental passage), or to a theme that is necessarily the conventional one, relating to love. If films are a “dream factory”, the music that supports them embraces these dreams and heightens all of the magic and emotional vitality. My invitation, my token is for these immortal “classics” to merge with the experiences, with the most precious memories, with the emotions of every listener, to become the inimitable soundtrack to their life. True to his status as a truly international artist, Andrea has recorded songs in five different languages (Italian, French, Spanish, English and Sicilian) and has partnered with global superstar Ariana Grande on the heart wrenching duet E Piu Ti Penso from Once Upon A Time in America/ Malena and Nicole Scherzinger on the epic musical anthem Don’t Cry For Me Argentina from Evita. I'm sure some of those are familiar to you, and you'll love hearing Andrea Bocelli's amazing voice on them. I will admit that, not only have I not been familiar with Bocelli's music, but I was not familiar with many of these songs, either. It didn't matter though. I thoroughly enjoyed listening to the entire album. I did enjoy the songs I was most familiar with most - Maria and The Music of the Night, to name a couple. I'm pretty sure I'm going to come to love all of the songs on the album, the more I listen. I'm loving the music (I'm loving the guitar on Brucia La Terra.) and especially Andrea Bocelli's voice on each and every song. This man can seriously sing! (I know, you probably could have told me that already) But seriously - just WOW! 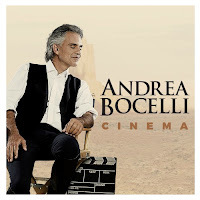 Grab your own copy of Andrea Bocelli's Cinema now. It's available for pre-order on iTunes and Amazon right now. Also be sure to look for Andrea Bocelli: Cinema, which will make its initial airing as the final presentation of PBS’ Fall Arts Festival, and is set to air nationwide across hundreds of PBS stations on November 27. The concert event will be personally arranged for Bocelli’s extraordinary voice by musical director, David Foster. I'm marking my calendar now! Now let me get back to listening to Cinema by Andrea Bocelli. After which, I will probably check out some more of his music on YouTube.